Zombievrobot's Blog | Another guy who watches too many horror films. Another guy who watches too many horror films. I can’t say enough about the Astron 6 videos, they blow me away every time, is that a pun? What? Oh, I See What You Did There. From the insane genius behind Lazer Ghosts 2: Return to Lazer Cove. Steve Kostanski presents Manborg! It’s obvious that I’ve been away from this blog a long time. It’s about 6 months since I’ve even attempted a draft but I’ve missed it and I’m desperate for an excuse to immerse myself in the horror films once again. For the first time in quite a while, there are some exciting new films on the way and I’ve just had the pleasure of watching through REC 2 and the surprising Dogtooth so I have some things to talk about. Stay tuned, there’s plenty of fun stuff on the way. Give These Guys Some Money. I just slogged through an obscure monster flick from the very beginning of the 80’s (which is coincidentally also the very beginning of my life). The Boogens is a dark and effective film despite being dragged down by too much talk and not nearly enough action. A mine is purposely demolished to seal up these turtle-like creatures. Years later when they attempt to re-open the mine, the Boogen are set free to cause very little trouble and kill very few. Practically harmless. The kill scenes are few and far between and the movie relies on the killing being done off screen which is not uncommon. The corpses and creature aftermath are enjoyably bloody and there are a few decent “It’s definitely dead now” jump scares. I’m a big fan of creature features from the 80’s. Critters, Ghoulies, CHUD are some of my favorites. 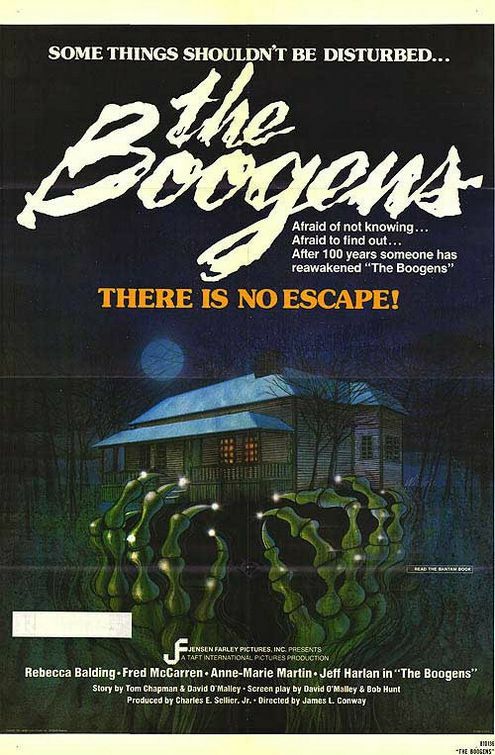 The Boogens is a hilarious bit of nostalgia and you’ll be hard pressed to find your own copy. Luckily there is hope. Check out campslasher He will show you the way. On to his next gem.